Paper pendants made from discarded cereal box cardboard are super easy to make! Add your own abstract artwork - as I have done with the ones pictured above - and you have exciting, bold and beautiful one-off pieces of jewellery to wear, sell sort give away as presents. These paper pendants were all made by me, using a discarded cereal box to create the jewellery form that I mounted my artwork on. They are really easy to make and I have made an easy to follow video so you can have a go. You can watch it below or find it on You Tube by clicking here. If you do not have your own artwork to use, then get painting! Or, you can use any image you like from photos to images in magazines. If anyone would like me to do a tutorial showing how I create my abstract paintings, please leave me a comment here and say so. 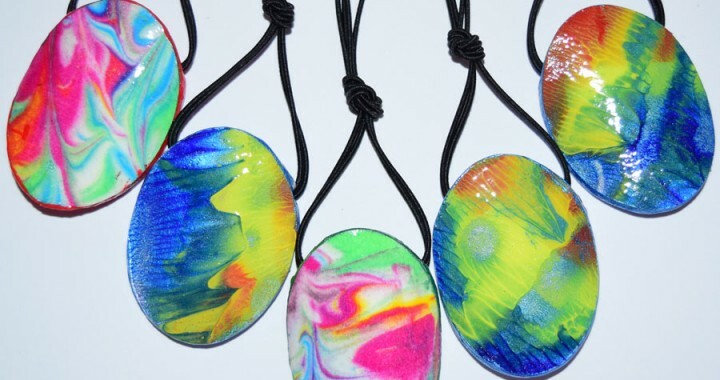 Have fun making your paper pendants by simply splashing vivid acrylic paints around on some good quality art paper. Do not get hung on 'doing it properly' - this is for fun and experimentation - there is no 'properly' - just play with the paint. Once it is dry, find an area of your abstract painting you really like and punch it out with a large oval craft punch. Having trouble sourcing products to make your paper pendants? The oval craft punch, the Triple Thick Glaze or the skinny candles (for creating the channel through the pendant), they are all available on Amazon. You can find links to the Triple Thick glaze, the flexible birthday cake candles and the 3" oval craft punch by visiting www.anythingexcepthousework.co.uk and scrolling down to the end of the post. I hope you enjoy the video and have fun making your own paper pendants from junk. If you have any questions, please leave a comment and I will do my best to help you. Don't forget, if you need guidance in getting started with making your own artwork, let me know and I will do a video tutorial for you. Check back here soon for more tutorials on using junk and paper scraps to make paper pendants and other beautiful jewellery - happy crafting! This looks like a fun project to do with a group! Thanks for the idea. Thank you Shirley! I really appreciate your visit here and your comment. These are surprisingly beautiful. I know my daughter would love this. Thanks for the idea! Thank you for reading and commenting – really appreciate it. These are very pretty and will make a bold statement when worn with a plain dress or sweater. It is a bonus that they are made from recycled material in a sustainable way. Thanks Gilly for showing us how to create from things that would have been thrown away. Thanks Judith – I get such a kick out of making stuff from junk card and paper. My craft room is full of free resources! I love that I don’t need to spend a fortune at the craft store. So pretty!! I could do that!! After I make the 4 quilts in my queue, curtain, ….. So, basically, next decade, maybe! Yes you so could! Well, if you ever do get making them – send me pictures to put on my blog. If you have any lovely makes you are really proud of, send me pictures with a bit of background on your craftiness – I would LOVE to put someone else’s work on my website.